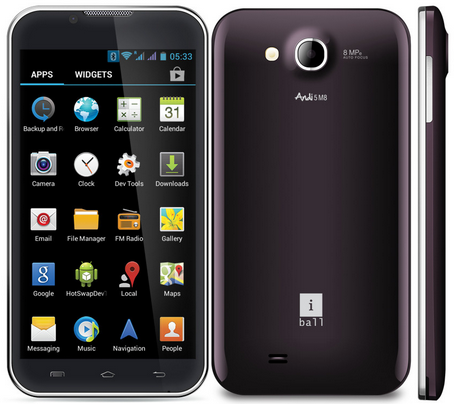 Another smartphone from iBall, iBall Andi 5-M8 appeared on India website recently with a price tag of Rs. 8,999. This phone adds to the list of dual core budget android devices below 10k range, and has been unveiled at a time when quad core phones are popping up in the same price bracket all around us. The new iBall Andi 5-M8, comes with a 5 inch display, with 854 x 480 pixels resolution similar to phones like Micromax Canvas Fun A76. Phones like Lava Iris 502 will offer you more pixels (960 x 540) for the same screen size, in the same price range. The processor employed in this phone is 1.3 GHz Dual core processor whose manufacturing company has not been specified. The processor is based on energy efficient cortex A7 architecture. The RAM capacity is 512 MB which is not impressive at this price range. The internal memory is 4 GB and can be extended to 32 GB using microSD card. The primary camera is of 8 MP which is above average if you consider the Megapixel count. The camera is supported by an LED flash and you will also get a VGA front camera for video calling. Connectivity features include 3G, Wi-Fi, Bluetooth and GPS. Battery capacity is 1850 mAh. This phone will compete against phones like Xolo A600, Zen Ultrafone 502 and Lava Iris 503. You can also get quad core phones like Intex Aqua i6, Gionee Pioneer P3 and Xolo Q800 in the same price bracket.